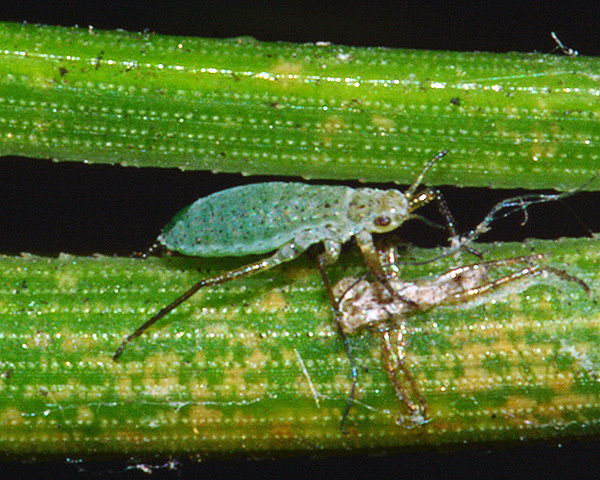 Eulachnus are small, narrow and elongate greenish to olive brown aphids with long limbs. The siphunculi are slightly elevated, rim-like structures. Their antennae are 6-segmented. The Eulachnus genus comprises about 17 species, all of which live on the needles of Pinus. They are cryptic when feeding, but very active when disturbed. The best-known species of Eulachnus show preferences for certain Pinus species, but none of them are strictly confined to one host species. Eulachnus agilis apterae are spindle-shaped and small. They are bright green with numerous dark spots and no wax (see first picture below). Their antennae are about 0.4-0.5 times as long as the body. The third antennal segment is more than 0.25 mm long and bears hairs 20-130 μm; long (cf. Eulachnus brevipilosus which has the third antennal segment less than 0.24 mm. long and bearing hairs less than 20 μm long.). The long antennal hairs of Eulachnus agilis are clearly visible in the second image below. The legs are rather pale with the hind legs often having mottled pigmentation. Hairs on the hind tibia are longer than the tibia diameter. The body length of the adult Eulachnus agilis aptera is 1.6-2.3 mm. 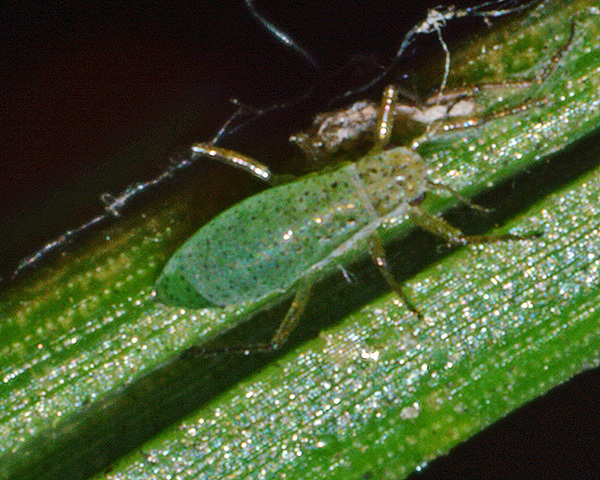 The spotted green pine needle aphid may be found feeding on old needles of many pines (Pinus spp. ), but it is especially common on Scots Pine (Pinus sylvestris). It does not host alternate. Oviparae and alate males are produced in October-November, and the oviparae lay eggs singly on leaf scars on the branches. Eulachnus agilis occurs throughout Europe and parts of Asia, and has been introduced to North America. Apterae of Eulachnus brevipilosus are spindle-shaped and slender. They are light green with numerous faint spots and no wax (cf. Eulachnus agilis which is bright green with numerous very dark spots). The antennae have six segments, and are about 0.4-0.5 times body length (cf. Essigella californica which has very short 5-segmented antennae). 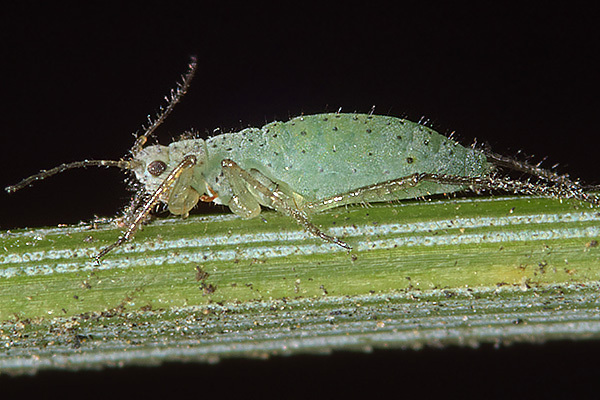 The name 'brevipilosus' indicates the aphid is short-haired. The third antennal segment is less than 0.24 mm. long and bears hairs less than 20 µm long (cf. Eulachnus agilis which has the third antennal segment more than 0.25 mm long and bears hairs 20-130 µm long). Also, the setae on the third antennal segment are no longer than the greatest diameter of that segment. The capitate hairs on the dorsal side of the hind tibia are no longer than the diameter of tibia at its midpoint (see micograph below). The legs are rather pale. 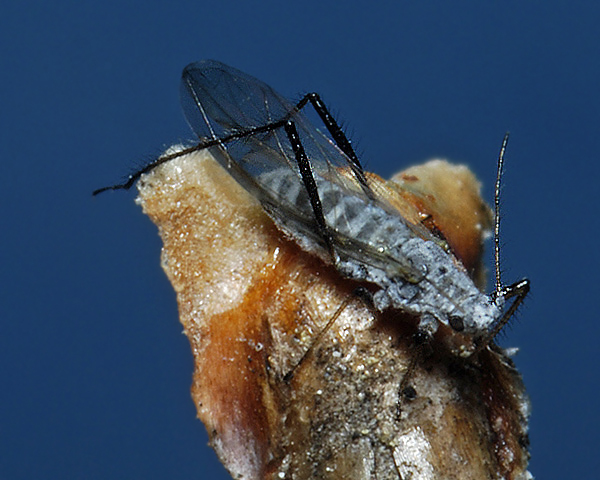 The body length of an adult aptera is 1.4-2.2 mm. 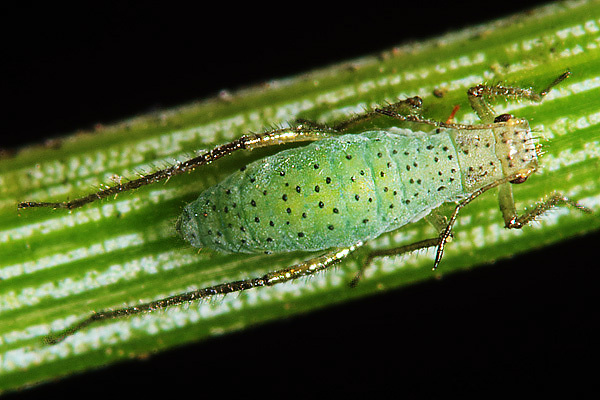 The light green pine needle aphid may be found feeding on needles on pines, especially on Scots pine (Pinus sylvestris) and stone pine (Pinus mugo). It does not host alternate. According to Blackman & Eastop (1994), sexual morphs have not been found - and they overwinter as viviparae. However, Zondag (1983) reports (perhaps wrongly) that sexual forms occur in Europe. Eulachnus brevipilosus occurs throughout Europe and parts of Asia, and has been introduced to North America and New Zealand. Wingless female viviparae of Eulachnus rileyi are very elongate spindle-shaped, and vary in colour from dark olive green to orange-brown or grey. They have prominent blackish setae on the dorsum. Older specimens become covered in bluish-grey wax (see first picture below), sometimes with tufts of wax filaments posteriorly. The hind pair of legs and other pairs to a variable extent are dark brown to black. The siphuncular cones are reduced to small blackish rings. The body length of Eulachnus rileyi apterae is 2.3-3.0 mm. Winged viviparae are similar to apterae, but with the head and thorax darker, and less prominent setae on the abdomen. 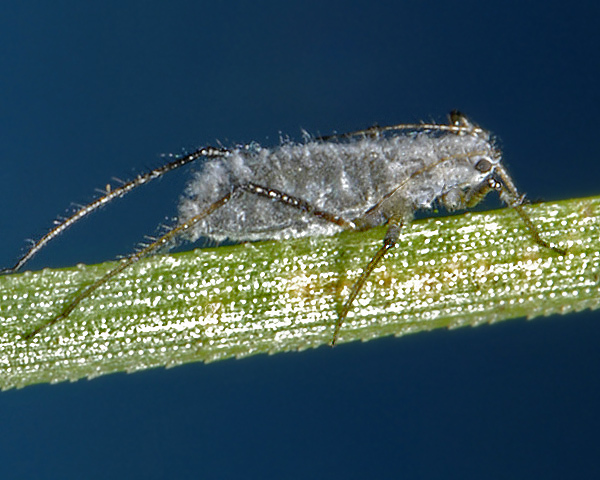 The active grey pine needle aphid can be found feeding on the needles of many species of pines (Pinus spp.). In Europe it occurs more commonly on European black pine (Pinus nigra) and mountain pine (Pinus mugo) than on Scots pine (Pinus sylvestris). Eulachnus rileyi are cryptic when feeding, but become very active when disturbed. The species is found in Europe, the Mediterranean area and south west Asia and has been introduced into Africa south of the equator and America.